PHOENIX – The battle over ballots in Arizona moved into the courtroom this week as the Republican Party in four counties filed a lawsuit against the state’s 15 county recorders and the secretary of state, setting up a showdown over voter rights vs. election fairness. Thousands of votes still were being counted as Republican Party leaders in Maricopa, Apache, Yuma and Navajo counties filed the lawsuit Wednesday night, claiming unequal enforcement of the state’s Election Day deadline. A judge on Thursday denied a request for a restraining order to stop the counting of early ballots, but a Maricopa County Superior Court hearing has been scheduled for 2 p.m. Friday. At stake: Arizona’s Senate seat, with votes just a hair’s breadth distance between Republican Martha McSally and Democrat Kyrsten Sinema. And, though not as prominent as the Senate, the race for the state’s top state education leader, the superintendent of public instruction, also remains too close to call. The final count is expected to take several days. By midweek, more than 600,000 votes, mostly from Maricopa County, remained uncounted. Republican leaders said they filed suit because various county recorder’s offices verify votes differently, with four counties allowing calls to verify voters’ signatures on early ballots after Election Day. mail-in ballots have to sign the back of the envelope and date it for it to be counted. 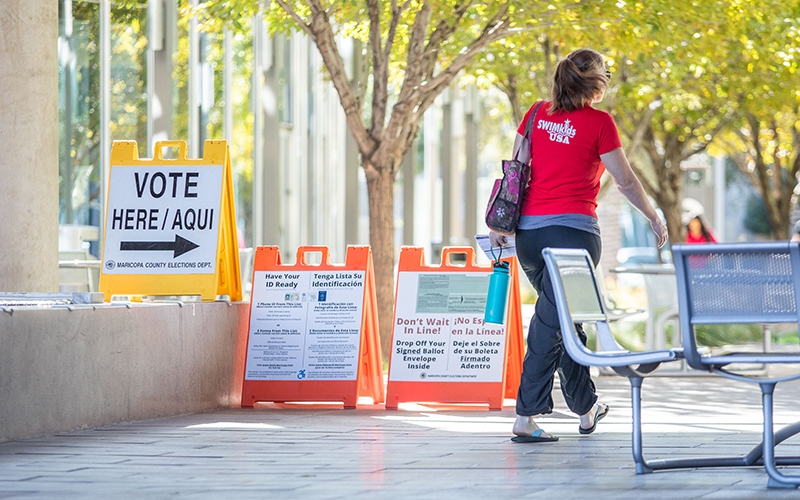 The lawsuit says Maricopa County, which includes most of metro Phoenix, and Pima County, which includes Tucson, are giving their voters an opportunity that’s unavailable to people who don’t live in the state’s two largest counties. Maricopa County Recorder Adrian Fontes, responded to the suit with a two-word tweet: Bring it. “Unfortunately, there are some people who don’t want me to be able to help those voters cure any mismatched signatures,” Fontes said. The lawsuit comes after one of the largest turnouts in history for a midterm election, with at least 1.7 million people voting in Arizona. Garrett Archer, a senior analyst with the Secretary of State’s Office, said earlier in the week that the long wait for election results stems from the volume of early voters who dropped off those ballots in-person from Nov. 2 through Nov. 6. “Ballots that come in on Election Day that are from early balloters have to go through the same process that the early ballots had gone through for the entire 28 days of the early ballot process,” Archer said, speaking before the lawsuit was filed.